Our condo is clean, bright & airy, facing the Gulf. We are on an upper floor, for a better view! We have a fabulous 3 night minimum stay, which is extremely rare on the island! Our complex is called The Beach Club and it's the only building that also offers a private gated beach walking path straight to the beach and less crowds. WE HAVE AN EXCELLENT REPUTATION! This is our home away from home, as well. Our four story complex offers a heated outdoor pool, with an ice machine conveniently located next to the pool. We have a nice sundeck with many loungers, tables, chairs, umbrellas & a couple BBQ grills. We have two outdoor showers, one for the pool and another one for your return from the beach! -The Hilton & The Marco Walk Plaza are only a half mile away, where you have many choices in restaurants, a movie theater, shopping and an ice cream shop! -The Sunset Grille is across the street, where you can enjoy outdoor dinner, drinks & music. -Caxambas Marina (where ski adventures, paddle boarding and kayaking all begin) is also less than a mile away. OPTION #2: We have a unit ON THE BEACH TOO! It's a beautifully remodeled 2 bed/2 bath condo with an upscale and modern feel. This is nice when traveling with friends/family! It’s HomeAway Listing #4654915. Take a look! We think you’ll like it as well. OPTION #3: DIRECTLY ON THE BEACH. Perhaps check out Listing #7279534, a cost efficient 2 bedroom condo, with superb views. Let us know if we can assist you with anything. We are here for you from start to finish. Amenities: Go to our website below to view additional information about the area, activities and/or make reservations for boating, fishing, sight seeing, etc. This has been our home away from home since 2002. Ideal location! It's well loved & cared for. Walk across the street to Sunset Grille for dinner & music. Best walking section in all of the island. We are simply across the street from the ocean and beach! Can see ocean from across the street. Consistently reviewed and replaced. Fresh. Nearby is where you can book your Jet Ski adventures, kayaking and paddle boarding. All just less than 1 mile away from the condo! Great location. Easy beach access. Pool was pleasant. Easy walk to restaurants. Family and couples friendly. Pool was closed for two days for maintenance. Very clean and great location! Loved having all the beach chairs, umbrellas, towels, cooler and a cart to carry it all! We would definitely stay again and recommend this place. The owners were very quick at responding to any questions or concerns we had! We have stayed at this condo several times and just love it. It is always very clean with a well equipped kitchen. The easy access to the beach is a real plus as is the view of the sunset from the lanai. You can also walk to several good restaurants. 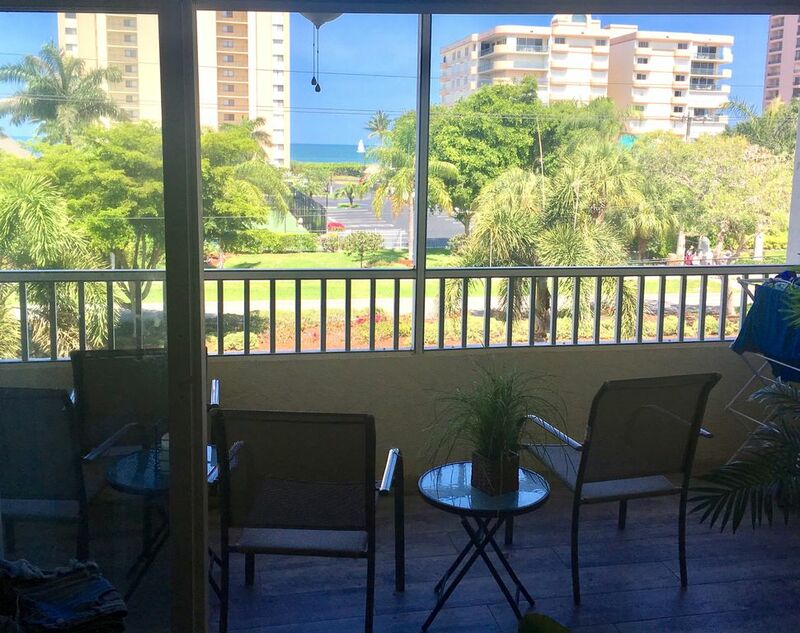 Great location,very clean,nicely decorated and even a sunset view from the lanai! Owners easy to work with - would highly recommend. The unit is well furnished with plenty of beach chairs, towels and umbrella. Also included is a beach cart, but we did not use. The kitchen is well equipped with utensils and cookware. Plenty of bedding and extra towels and sheets. The owner has always been very responsive with any questions. We have stayed in this unit for a number of years. You are truly at a perfect location for everything that you need! Deposit: $300-weekly, $500-monthly; Inquire upon daily rental fees. 3 night minimum required.